OFFICIAL/PERSONAL MISCONDUCT NOTICE TO PRINCIPAL IS NOTICE TO AGENT. NOTICE TO AGENT IS NOTICE TO PRINCIPAL. 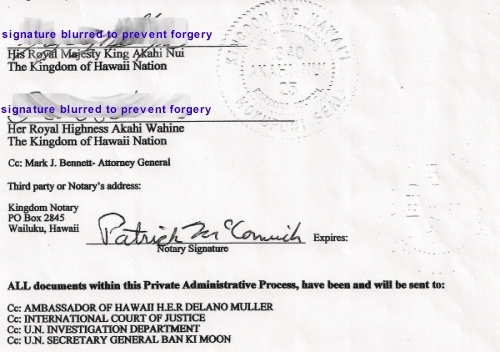 Proof(s) of Claim in behalf of THE OFFICE OF GOVERNOR, that there's no fraud on any claim of title or action(s), nor of any unconscionable contract affecting any such land and/or the Sovereign Kingdom of Hawai'i, that you and/or your office did in fact have a meeting of the minds with us, the lawful Heirs of the Sovereign Hawaiian Islands and Holders in Due Course of the Allodial Patent Lands therein, and proof of claim as to any agreement, contract, lease, rental agreement(s), Political representation and by what lawful or legal authority do you deny dominion over the Sovereign Hawaii Islands to the said Heirs and of the release and replevin of the said lands and Islands that constitute the Sovereign Kingdom of Hawai'i to the lawful Heir. That alleged land owners, corporations, including but not limited to ALEXANDER & BALDWIN INC., have given or gave full disclosure to the alleged acquired titles/deeds/quiet title actions/quick claim deeds and any contract(s) that were signed throughout the history of the alleged title/contracts and that you, Linda Lingle, as acting Governor have acted honorably by investigating all the facts before making decisions, choices, and/or orders and do not have a conflict of interest in such by perceiving to own land yourself within the Sovereign Kingdom of Hawai'i. 1. PROOF OF CLAIM that Majesty Akahi Nui is not the 100% blood lineage heir to the Kingdom of Hawaii and all lands therein. 2. PROOF OF CLAIM that Majesty Akahi Nui is not a direct descendant of King Kamehameha III as documented by Honorable Lorrin Andrews; In the matter of the Estate of His Majesty Kamehameha III, Judge of Probate -Cause Number; 2410 dated April 2, 1853. 3. PROOF OF CLAIM that all land and property recorded and filed within Financing Statement No. : 2007-287-2418-3 and 2007-192182 is not reserved and owned by The Kingdom of Hawaii by and through Majesty Akahi Nui AND IS NOT HELD IN TRUST BY THE Kingdom of Hawaii Nation Ministry Trust. 4. PROOF OF CLAIM that the filing of Financing Statement No. : 2007-287-2418-3 and 2007-192182 which includes ALL Royal Land Patents and Allodial Patent Lands, does not establish a Superior Security Interest and lien on the property identified therein with The Kingdom of Hawaii Nation. 5. PROOF OF CLAIM that the ROYAL PATENT DEED No. 1028 DECLARATION OF CONFIRMATION Document is not recorded and filed with the BUREAU OF CONVEYANCES at 1151 Punchbowl Street, Honolulu, Hawaii 96803-2867. 6. PROOF OF CLAIM that ALL alleged land owners, companies, title companies, corporations, including but not limited to ALEXANDER & BALDWIN INC., or whomever, sold, transferred or signed titles, deeds, quiet title action(s), quick claim deed(s), any other land contract(s), since 1853, acquired 'lawful title' to any of the said lands found within the Kingdom of Hawaii Nation. 7. PROOF OF CLAIM that the past and current titles, deeds or otherwise that were sold, bought, transferred, exchanges or otherwise that the so-called 'buyers' did not only acquire 'Warranty Deed', being a promise as to a clear title. 8. PROOF OF CLAIM that the Sovereign King Majesty Akahi Nui for the Kingdom of Hawai i Nation by and through the The Kingdom of Hawaii Nation Ministry Trust is not the holder of the Original Title to the property as described in financing statement 2007-287-2418-3 and 2007-192182. 9. 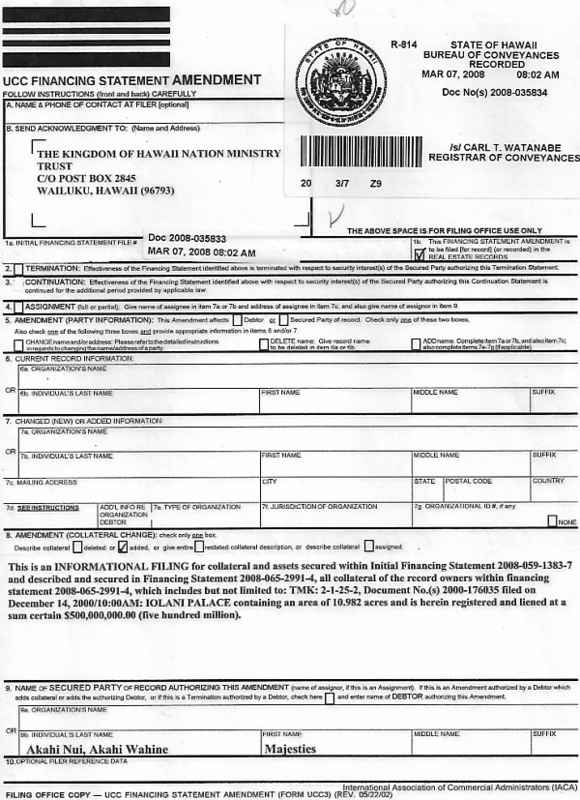 PROOF OF CLAIM that a Public Notice from the Kingdom of Hawaii through it's heir, stating ownership and Superior security interest in the four Hawaiian islands was not published locally, and abroad, exceeding the statutory time limit and was rebutted, contested or objected to by you and/or your office. 10. PROOF OF CLAIM that a Public Notice, Affidavit of fact, confirming superior security interest and non rebuttal to same was not published locally and abroad. 11. PROOF OF CLAIM that Linda Lingle acting in the corporate capacity as governor of the State of Hawaii does not agree that via said Public Notices, being un-rebutted, stand in the public record as true and that the world at large has not failed to object. 12. PROOF OF CLAIM that Linda Lingle acting in the corporate capacity as governor, is not in error nor operating in fraud by claiming to have lawful authority to endorse, act for, sign for, assign, and/or otherwise speak on the behalf of the Kingdom of Hawaii Nation or its people. 13. PROOF OF CLAIM that any party, person, corporation or otherwise, including but not limited to ALEXANDER & BALDWIN INC., or any other person or entity at anytime has produced lawful title superior to that held by Majesty Akahi Nui's. 14. 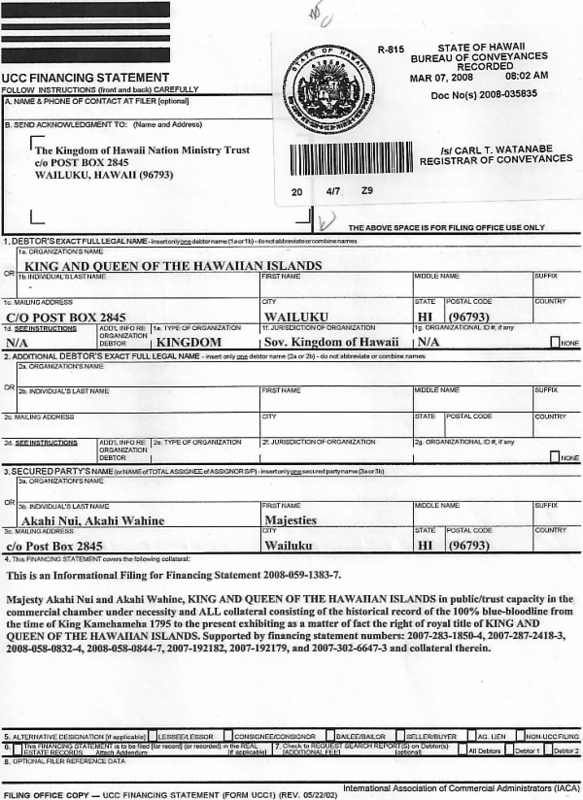 PROOF OF CLAIM that you; Linda Lingle, as acting Governor of the State of Hawaii have acted honorably by investigating all the facts dealing with the existence of the Sovereign King Majesty Akahi Nui for the Kingdom of Hawai i Nation before making decisions, choices, executive orders or otherwise and that you do not have a personal conflict of interest in such by perceiving to own land yourself within the Kingdom of Hawaii Nation. 15. 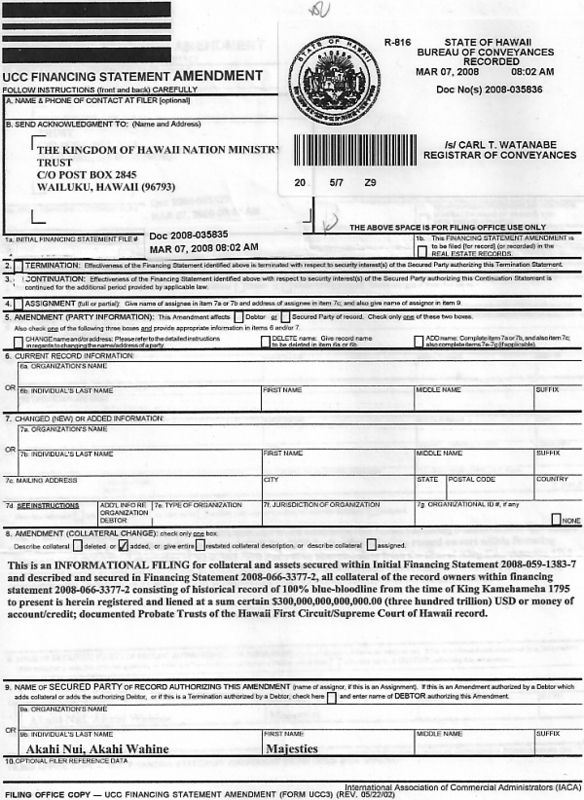 PROOF OF CLAIM that Majesty Akahi Nui, does not have Right of Entry, Right of Possession, 100% Ownership and a $500,000,000.00 (Five-Hundred-Million) Security Interest (lien) documented within Financing Statements: 2008-059-1383-7; 2008-035834 and 2008-035833 to the IOLANI PALACE. 16. PROOF OF CLAIM that you, Linda Lingle, do not need to remove yourself and company from the building known as "Washington Place" as it is meant for the de jure Hawaiian government and Royalty. 17. PROOF OF CLAIM that you, Linda Lingle, are not flying the "Governors Flag" of Hawaii as a mockery in your current capacity as governor for the de-facto-SATE OF HAWAII and as such, show where you will not be directed to lower said flag which is reserved for the real and de jure governor(s) for the Kingdom of Hawaii Nation. 18. 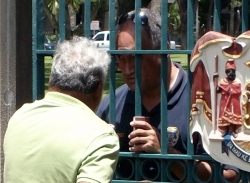 PROOF OF CLAIM that Majesty Akahi Nui, a direct descendant of King Kamehameha III does not have a lawful Right, as 100% Lineal Heir, to be in full control and Rein as Sovereign King over all of the Kingdom of Hawai i Nation, including but not limited to every acre of said soil, land and property of and within these Hawaiian Islands. As we wish to resolve this issue as soon as possible. Therein, upon you or your office (employees, representatives, agents or officers) in failing or refusing to produce or provide the requested Proof(s) of Claim, you will fail to state a claim upon which relief can be granted and said failure or refusal constitute 'your' agreement of all the facts operate in favor of the Majesty Akahi Nui. Upon your dishonor and default in this matter, your said silence constitutes stipulation, admission and confession of fraud on the matter, that you, Linda Lingle, Acting Governor for the de-facto corporate state of Hawai'i and all corporations, including but not limited to the corporation; ALEXANDER & BALDWININC., including their representatives Charles Loomis and Deborah K. Wright, have committed unconscionable act's and you agree that there was no meeting of the minds between you, the corporate state of Hawai'i and The Sovereign Kingdom of Hawaii Nation by/and through the Kingdom of Hawai'i Ministry Trust; that Linda Lingle, failed to give full disclosure as to her authority; and that you agree that acting as governor for the de-facto state of Hawaii failed and neglected to act honorably by refusing to recognize the lawful existence of the Royal Family Majesty Akahi Nui and Akahi Wahine; therein causing personal injury, commercial injury and damage to the Undersigned's. You will by your dishonor and default, waive all right to defend and/or yourself and any corporate entity doing business within the state of Hawaii including, but not limited to ALEXANDER & BALDWININC., and is estopped in any defense to the matter. Therein, presumption will be taken in regards to your dishonor, admission, confession, injury and damageand failure to state a claim, that you; Linda Lingle, in your private and official capacity recognize the proper, historical and lawful existence of the Sovereign Heir His Royal Majesty King Akahi Nui, The Kingdom of Hawai'i, that Majesty Akahi Nui and Akahi Wahine are the true Sovereign Authority over the Hawai'i Islands and that you will relinquish your office, and vacate and remove the de-facto State Corporation, its employees, etc. 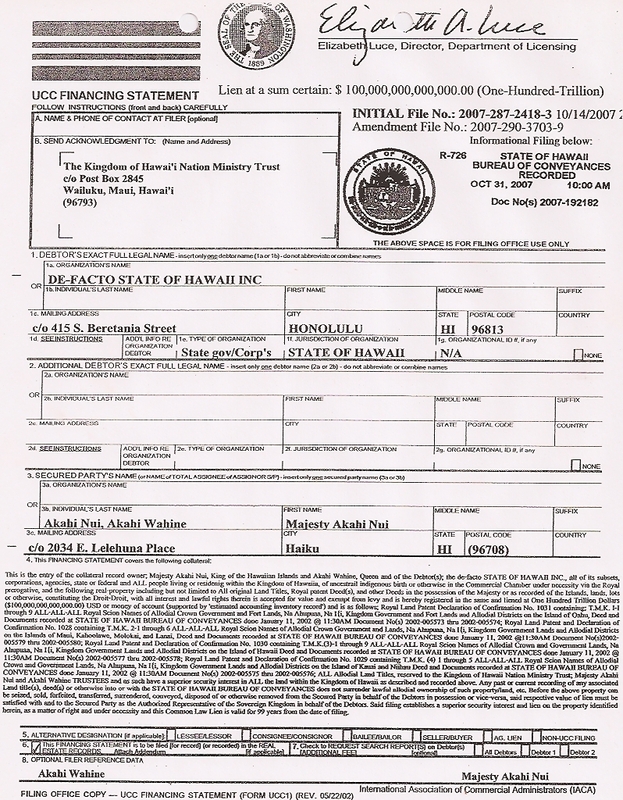 within 365 days or any amount of days agreed upon after in person negotiations and you are giving permission for a lien to be filed against the Corporate State of Hawai'i, YOURSELF, and ALEXANDER & BALDWIN, INC., for said malice, fraud, injury, wanton and reckless actions, default and dishonor for damages, under necessity as a matter of Right. Due to the nature and recent urgency of this matter, you are to respond within 7 days by return mail, certified, to the Undersigned and a copy to the Third Party or Notary as addressed below. replevin - In creditors' rights law, replevin, sometimes known as "claim and delivery," is a legal remedy for a person to recover goods unlawfully withheld from his or her possession, by means of a special form of legal process in which a court may require a defendant to return specific goods to the plaintiff at the outset of the action (i.e. before judgment). In other situations, a party seeking relief may elect to adjudicate the right to possession prior to obtaining immediate relief to obtain the property in question. In such cases, replevin actions are still designed to afford the petitioning party a relatively speedy process for obtaining judgment, as compared to typical lawsuits. The summary remedy afforded by replevin statutes can be thwarted by defendants who contest the claimant's right to possession, by contesting the plaintiff's complaint, and insisting on traditional litigation involving discovery, and in some cases, trial by jury.